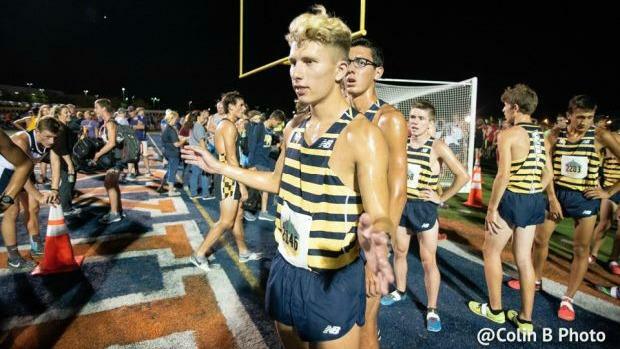 The high winds that Mother Nature produced may have robbed us from seeing some amazing times at the Naperville Twilight Invite, but it didn't thwart us from watching some great races. The team battle came down to the wire with Neuqua Valley sneaking a win past a very powerful Glenbard West team. The Wildcats were led by a great performance by senior Chris Keeley who took fourth place with a time of 15:13. Keeley was closely followed by his teammate senior Michael Madiol, who took 6th place with a time of 15:27. The Wildcats ran a great race as they were far back through the first mile, but started to move up during the remainder of the race. They had a 42 second 1-5 split with a 3-5 split of 1.4 seconds! Coach Paul Vandersteen said before the race that his team was looking a bit flat that day. He gave them Sunday off and had them do a 9-mile progression run on Monday. Vandersteen also said after the race that he didn't think his team had their best performance this year at the meet and that they can be much better. Glenbard West may have taken second place in the team race here, but there were a lot of positive notes for the Hilltoppers. They had a one, two punch of seniors Rory Cavan and Stephen Moody. This was Moody's first excellent performance of the year after he hasn't run as well as he should have in his previous meets. Moody ran a 15:09 which is only 14 seconds of his seasons best in less than ideal conditions. Senior Will O'Brien had a breakout race by taking 15th place with a time of 15:49.9. The 4-6 split was very impressive as senior Ian Repking, sophomore William Hohe, and sophomore Pierce Cousins ran within 1.7 seconds of each other. The one thing that they need is Repking to move up with O'Brien. The duo ran in the low 15 minutes last year, but Repking has not been competing up with O'Brien as of late. This is a huge confidence booster for the Hilltoppers as they head into their conference meet. Downers Grove South did not have their best performance. Three days after they had a Cinderella win at the Peoria High Invite, they took third here. The Mustangs were led by senior Eddie Siuda who had a seventh-place performance with a 15:28.9. This looked like a completely different team. John Heneghan, John Norris, and George Willer didn't have their typical signature performances. Norris was a huge factor of why the Mustangs ran upfront in Peoria vs. the Twilight. There was a big difference between 14:52 three days prior to running a 16:17. Senior Matt Moravec of Downers Grove North looks like he is back to being his old self with a third-place finish in a new season best of 15:11.4. Moravec really stepped up for the Trojans as their #1 runner Jack Roberts will be out for the next few weeks as he is dealing with a minor back injury. Coach John Sipple said that we shouldn't expect to see Roberts before sectionals. Good news for the Trojans is they have a very solid #2 guy that can jump into the #1 spot for Roberts while he is out in Moravec. Senior Thomas Shilgalis of Naperville Central was feeling some dead legs in this race. Three days prior he won the Peoria High Invite with an IL#1 time of 14:11. The eye-opening performance was Shilgalis's first feel-good race of the year as he had been dealing with bronchitis. This time Shilgalis was unable to defend his title as he took 5th place with a 15:19.1. Overall, the Twilight was a great preview of some of the top teams and individuals in the state. The championship season is looking like it will be a home run and much better than most expected.